BEARPAW® - Live life comfortably. In 2001, Tom Romeo founded the BEARPAW brand with the idea of redefining casual shoes with sheepskin, nature´s own technical fabric. Since sheepskin naturally regulates body temperature, feet stay cooler and drier in the heat and warmer in the cold. 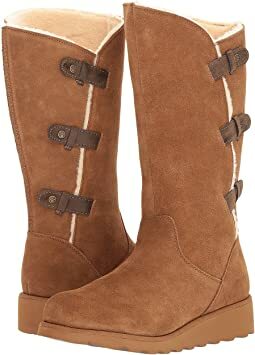 BEARPAW has carved out a niche by providing its customers with comfortable and sensible shoes. From slippers and sandals to your favorite sheepskin boots, BEARPAW has it all. They use the finest materials to create each masterpiece. Every single pair is built to deliver lasting quality and style. 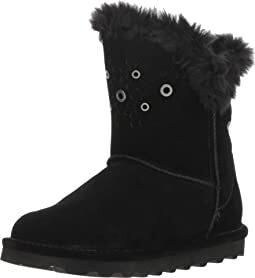 Shop the vast collection of BEARPAW boots with materials ranging from sheepskin to wool. With an emphasis on providing comfort and the ultimate fit, they have created several collections full of favorites. 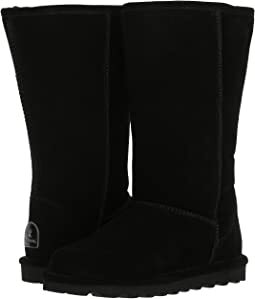 As BEARPAW grows, they will continue to offer boots, slippers and sandals for the utmost in comfort and style. BEARPAW is more than just shoes, it is a lifestyle that allows you to reflect on who you are and what is important to you. I usually wear an 8.5 but based on other reviews I ordered the 9, so that's why I report that the boot felt a half size smaller. I'm not even sure it comes in half sizes but I'd not be able to fit into the boot in a smaller size. The boots are cute and comfortable, I wore them for the first time all day while setting up for, hosting, and breaking down from a retirement party for my husband in an art gallery with a concrete floor. For 6 hours I honestly didn't notice any foot soreness, but it did kick in at around hours 7 and 8. For me to have stood (and walked around) all day without sitting down and being on such a hard floor, a little tiredness is expected. These held up well. When I first tried them on I thought, oh, no, another pair of normal width footwear that is going to be too tight/narrow for me. They were so tight! I gave them about a half hour walking around my house and they loosened up perfectly. I do have sensitive feet and require a little extra room across the ball of my foot, so wider styles are better for me. These are very perfect for my foot. Other reviewers noted that the lining feels cheap and fake, and I must admit that I think the wool blend stuff feels like weird synthetic fiber. The footbed is lined with shearling and is heavenly soft. They call it "sheep fur" in the description which made me laugh, I think they mean "shearling" or "wool". The wedge heel is OK but I would have preferred something that's more like a waterproof lug sole or other rubber outsole. 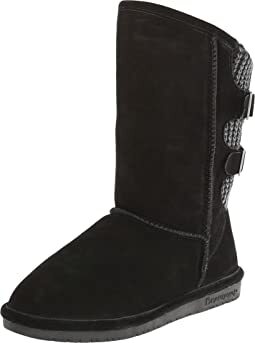 I think something a bit more rugged with definition (like separate heel area and front-foot area) would look better, like you find on the cuter Kamik and Baffin boots. I wanted something fairly water resistant for rainy winter months, combined with something that would look cute with skinny jeans. These do a good job for the price without breaking my budget. I won't be wearing these so much in snow (maybe Lake Tahoe) as I will in rainy conditions in north-central California (SF Bay Area) and the little wedge doesn't look bad once you put the boot on. Love these boots. Adorable and comfortable from the first moment I put them on. I'm hoping they really are waterproof ... I'll see, but I don't think I'll put them on if it's raining. But they are very cute and I feel good wearing them! 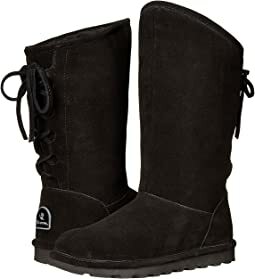 This is my second pair of Bearpaw boots. 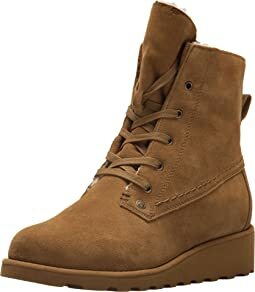 Ordered sz 8, fit just like 1st pair except left boot put pressure on my toe. After wearing for awhile it goes away. Will break in. I love the designs they think up for the boots. They no longer make the Mimi which was my 1st pair. I wanted to get the Mimi again but settled for the Andrea. Super cute! Got hickory color cuz you could see the designs better. I wish the soles lasted a little longer. Maybe it was just me wearing them out as winter lasts for 5 month where I live. The body of these boots keep their shape and even after 4 winters of wear on my mimi's they look as good as new. These boots are warm and do not retain sweat in them. 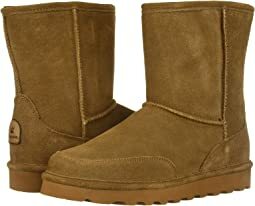 And they are 1/2 the price of Uggs and have cuter styles!! I usually wear 8 1/2 and need width. I ordered a 9. The fit is OK. Leaves room for heavier socks. Have not ventured out in snow with them yet, so don't know about waterproofing. Seem very warm. 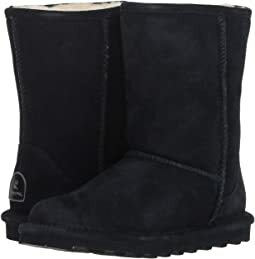 I chose Bear Paw because I did not want to pay Uggs prices. Because of all the fuzzy lining on the inside I'd order a half size up. Really cute and comfortable! I love these boots! I'm a half size so I went by the recommendation and ordered the size up and they fit perfectly. Super comfortable and lightweight. I love them they are awesome! 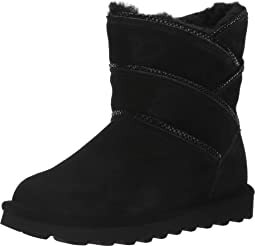 I already have a pair of Bearpaw boots in a different style and really love them, so I was confident I would be keeping these. However, even though they're the same size as my other boots, I measured the sole against my old ones; these boot soles are about a 1/2" shorter so my toes hit the end of the boot so they're way too tight. They also have no support, whereas my other ones have moderate support. I'm really disappointed, but these boots going back. 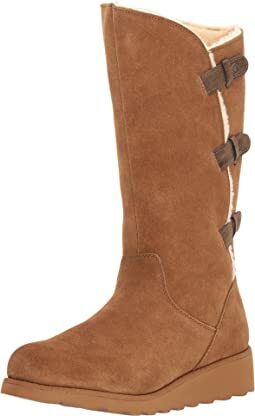 Bought these to compare with Uggs Classic Short II in a similar color but $65 more. 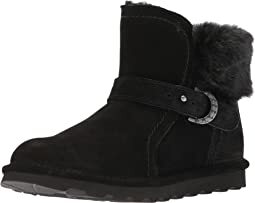 I had really hoped to keep these due to the considerably better price, however, when I looked at them and when I stepped inside, I could immediately tell where Bearpaw had cut costs. First, I wasn't a fan of the matching sole and boot color, but I was willing to overlook that for the savings. Seeing them in person didn't help how I felt about the monochrome look. The trim of the soles (on both boots) already looked like it had been scuffed (aka the color was somewhat rubbed off and inconsistent) along much of the boot's edge (not something I had set out to examine, which tells you that they were truly noticeably inconsistent). 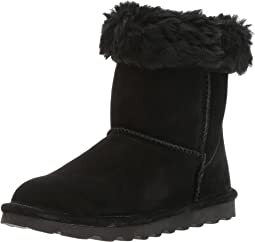 Now, I'll give this to Bearpaw, the fur on the inside is *much* softer than Uggs (which are already also deliciously soft and is the only reason why I would buy such plainly ugly shoes). 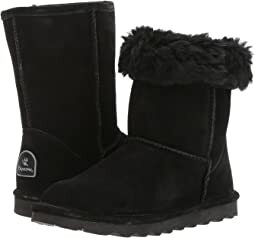 Bearpaw's fur is just plain softer, and for that reason, more than even the cheaper price, I wish that the Bearpaws had worked out for me. Moving on. The Bearpaws are very narrow. I guess I have a normal width foot since I have always bought regular width shoes, but these Bearpaws were uncomfortably narrow on my foot. I don't think this is a problem across all Bearpaws because a LONG time ago I bought a wonderful pair of black furry Bearpaw boots that did not have this problem (they were the kind with the cute tortoise shell side accent). Moving on...the part of the boot that houses the toes is stiff and feels kind of like it is made of cardboard. Combine that with the narrowness and these boots are simply uncomfortable. Additionally, compared with the Uggs, they have much less cushion when you step down. Last but not least, I wear a 7.5 normally and bought these in an 8 because I knew they ran small, and they were still a half size too small. Ok, that's it. 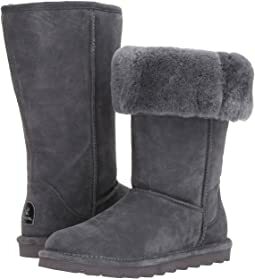 I almost never review products unless I'm in love with them, but I thought these might help others deciding between these and Uggs. 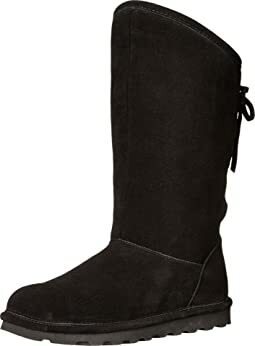 So I’ve been looking for these boots all over in my size, and I stumbled across Zappos, and found them in my size!! !and the best part they are 44$, other places 99$ ! The shipping is AMAZING, it’s free and was here in less than 24 hours! But I did notice there are some flaws on the boots, maybe that’s why they where 44$?? Scuffs on inner part of both boots, and the fur, on one size looks and feels like there is glue , or it was exposed to heat! That is why I rated 4 stars. These boots are excellent and cute! They a little tight on my ankles but pretty much every shoe I buy is. Once you break them in they loosen up. Also these are waterproof unlike my uggs. I dont worry about wearing them in bad weather. 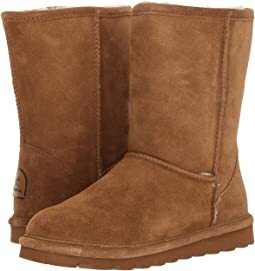 Comparing a 10 Bearpaw to a 9 Ugg (I size down in Uggs) they are the same iwidth/ length on the exterior. The difference seems to be that the sheepskin lining isn’t as plush in the Bearpaw and doesn’t hold my foot as snugly - or snuggly! A thin sock feels better with the Bearpaw. There are 3 holes on that adjustable strap. I just moved the peg to the loosest one and left it there, so I can get my foot in without undoing the strap. The black suede is not as soft or plush as my blue suede Uggs (OK sometimes the color makes a difference!) 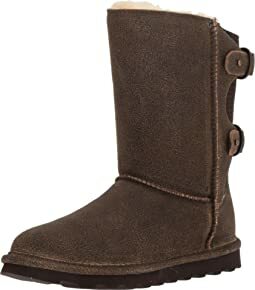 but I chose the Bearpaw for the, “NeverWet” Technology, and was willing to put up with that so I could wear them in wet weather without staining. They are cuter on looking in a mirror that’s they are looking down, if that makes sense. I like the low height in this case. I’ll have to let you know how they are for all day comfort after I’ve worn them out for a long period. 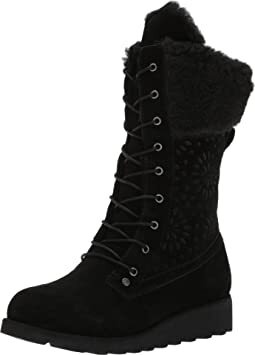 I love this boots, the style, material and everything, they feel so confortable and dont get wet with snow, your feet will feel warm and confy all the time. I have worn Bear Paw for many many years now walking my wolves. These are the only ones I have found to be sturdy, and have a VERY good sole that does not slip. They are high and protects my legs from all the bushes I have to go through when walking them. They stay in place and don't fall down. 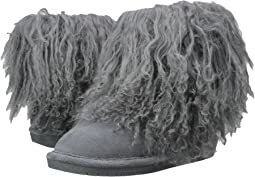 I buy 2 pair a year because it seems like every 6 months the soles wear down, which is understandable because I put so much wear and tear on them and my wolves are very hard on them taking me out into the woods several times a day. If I wore these like a normal person I would probably only have to buy one pair a year. They are so worth it. I go out for hours in sub zero weather and my feet do not get cold and in the summer my socks absorb any moisture. So cute! I ordered the camel color and they are really adorable. The fur trim is so soft. Great to wear around the house but also out and about. I do not recommend you wear these in rain or snow. Zappos, please make these available in black!!! So warm but they need to be sealed and they didn’t send sealer. I bought a size larger than I normally wear as other users have recommended. These shoes are surprisingly comfortable considering they are super flat (which works great for my flat feet). The only issue is that the fur lining on the foot gets used to your foot and wears. I can't see wearing them more than one season because the lining will be worn through. After just a week or 2 of wear I'm already wearing the toe area through. 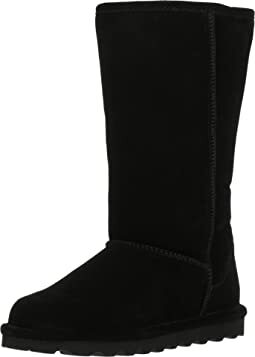 They are super hot so great for long walks to the parking lot but not particularly great if you are in a warm area. I waterproofed them before wearing. They don't leak. IF........you can get them on...you'll be happy because they are pretty cute. (they do run wide). For sure, don't wear them shopping because taking them on and off can wear you out. That being said.... 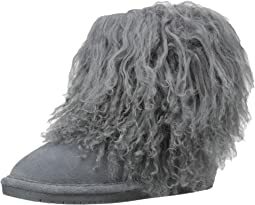 They are warm and comfortable....EXCEPT...after wearing them for awhile the wool clumps between your toes. Makes me crazy. Other than these two issues, I like them. These boots are a little tight in the toe box area, but seem to be stretching out just fine. After wearing them twice, they are very comfortable, and so cute!! I love them.